Did you know Bristol Farms’ soups are handmade daily from scratch by a small team of Soup Chefs in our Central Kitchen? Our soups have been a customer favorite for years. You can really taste the difference, and here’s why: Bristol Farms carries over 75 varieties of soup year-round. Our Soup Chefs meticulously make each batch with attention to detail by using fresh quality ingredients, such as chicken and beef that is strictly fed antibiotic-free feed, farm-fresh vegetables, and quality spices. Our Soup Chefs hand chop, cook, and stir each batch of fresh handmade soup from a large kettle. Each gallon of soup is packed by hand and immediately cooled in an ice bath, then shipped to the stores. You can find our soups in the refrigerated section of our deli in pre-packaged pint and quart size containers. 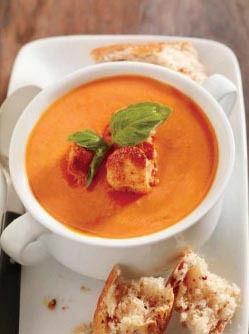 We also offer a daily variety of piping hot, ready to eat soups in our soup bar, located in the deli. *Offerings vary by location. Please call the deli department in your nearest location for exact availability. If you see something here the store is not currently offering, just ask our deli personnel! We’ll be happy to send off a batch.